The OpenEye toolkits are programming libraries, commonly called software development kits (SDKs), for creating custom applications, scripts and/or web services. All of the toolkits are developed in C++ to ensure exceptional performance but are also available to developers in Python, Java, and .NET for maximum flexibility and utility. Each toolkit has its own well documented and stable API with extensive examples. 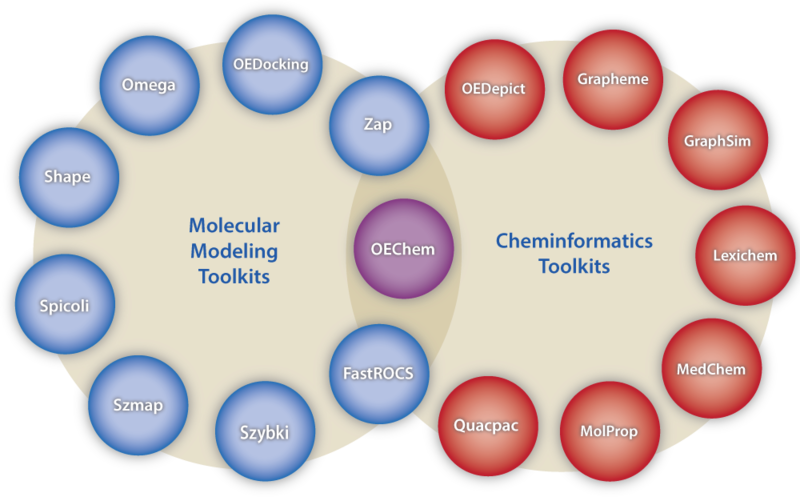 The toolkits are broadly categorized into two major suites: Cheminformatics and Modeling. In addition to the extensive API documentation provided for each toolkit, we also provide a Python Cookbook containing an ever growing collection of solutions and practical examples for cheminformatics and molecular modeling problems. To learn more about what others are doing, please visit our Integration Partners page showcasing a wide variety of organizations using OpenEye tools to provide their own custom solutions and services.